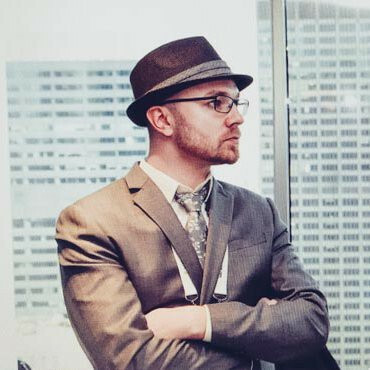 At this point, you’ve almost certainly heard the tale of Eric Lundgren, the electronics recycler who is now looking at spending 15 months in prison because he was duplicating freely available Windows restore discs. Of no use to anyone who doesn’t already have a licensed copy of Windows, these restore discs have little to no monetary value. In fact, as an individual, you couldn’t buy one at retail if you wanted to. The duplication of these discs would therefore seem to be a victimless crime. Especially when you hear what Eric wanted to do with these discs. To help extend the functional lifespan of older computers, he intended on providing these discs at low cost to those looking to refurbish Windows computers. After each machine had its operating system reinstalled, the disc would go along with the computer in hopes the new owner would be able to utilize it themselves down the road. It all sounds innocent enough, even honorable. But a quick glance at Microsoft’s licensing arrangement is all you need to know the whole scheme runs afoul of how the Redmond giant wants their operating system installed and maintained. It may be a hard pill to swallow, but when Eric Lundgren decided to use Microsoft’s product he agreed to play by their rules. Unfortunately for him, he lost. It would be difficult to imagine the technological enhancements to the world we live in today without open-source software. You will find it somewhere in most of your consumer electronics, in the unseen data centres of the cloud, in machines, gadgets, and tools, in fact almost anywhere a microcomputer is used in a product. The willingness of software developers to share their work freely under licences that guarantee its continued free propagation has been as large a contributor to the success of our tech economy as any hardware innovation. Though open-source licences have been with us for decades now, there have been relatively few moments in which they have been truly tested in a court. There have been frequent licence violations in which closed-source products have been found to contain open-source software, but they have more often resulted in out-of-court settlement than lengthy public legal fights. Sometimes the open-source community has gained previously closed-source projects, as their licence violations have involved software whose licence terms included a requirement for a whole project in which it is included to have the same licence. These terms are sometimes referred to as viral clauses by open-source detractors, and the most famous such licence is the GNU GPL, or General Public Licence. If you have ever installed OpenWRT on a router you will have been a beneficiary of this: the project has its roots in the closed-source firmware for a Linksys router that was found to contain GPL code. Now we have news of an interesting milestone for the legal enforceability of open-source licences, a judge in California has ruled that the GPL is an enforceable contract. Previous case-law had only gone as far as treating GPL violations as a copyright matter, while this case extends its protection to another level. The case in question involves a Korean developer of productivity software, Hancom Office, who were found to have incorporated the open-source Postscript and PDF encoder Ghostscript into their products without paying its developer a licence fee. Thus their use of Ghostscript falls under the GPL licencing of its open-source public version, and it was on this basis that Artifex, the developer of Ghostscript, brought the action. It’s important to understand that this is not a win for Artifex, it is merely a decision on how the game can be played. They must now go forth and fight the case, but that they can do so on the basis of a contract breach rather than a copyright violation should help them as well as all future GPL-licenced developers who find themselves in the same position. We’re not lawyers here at Hackaday, but if we were to venture an opinion based on gut feeling it would be that we’d expect this case to end in the same way as so many others, with a quiet out-of-court settlement and a lucrative commercial licencing deal for Artifex. But whichever way it ends the important precedent will have been set, the GNU GPL is now an enforceable contract in the eyes of the law. And that can only be a good thing. As an Apple user, I’ve become somewhat disillusioned over the past few years. Maybe it’s the spirit of Steve Jobs slowly vanishing from the company, or that Apple seems to care more about keeping up with expensive trends lately rather than setting them, or the nagging notion Apple doesn’t have my best interests as a user in mind. Whatever it is, I was passively on the hunt for a new laptop with the pipe dream that one day I could junk my Apple for something even better. One that could run a *nix operating system of some sort, be made with quality hardware, and not concern me over privacy issues. I didn’t think that those qualities existed in a laptop at all, and that my 2012 MacBook Pro was the “lesser of evils” that I might as well keep using. But then, we published a ThinkPad think piece that had two words in it that led me on a weeks-long journey to the brand-new, eight-year-old laptop I’m currently working from. Those two words: “install libreboot”. Some tools in a toolbox are versatile. You can use a screwdriver as a pry bar to open a paint can, for example. I’ve even hammered a tack in with a screwdriver handle even though you probably shouldn’t. But a chainsaw isn’t that versatile. It only cuts. But man does it cut! AWK is a chainsaw for processing text files line-by-line (and the GNU version is known as GAWK). That’s a pretty common case. It is even more common if you produce a text file from a spreadsheet or work with other kinds of text files. AWK has some serious limitations, but so do chainsaws. They are still super useful. 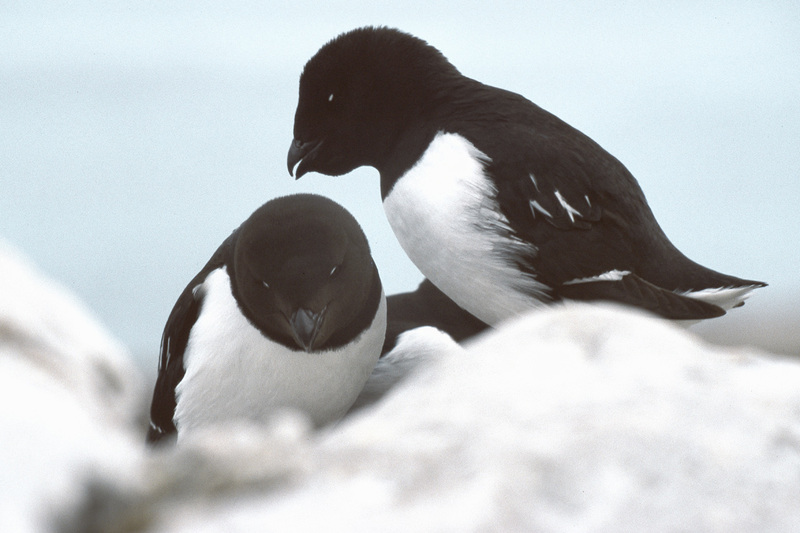 Although AWK sounds like a penguin-like bird (see right), that’s an auk. Sounds the same, but spelled differently. AWK is actually an acronym of the original author’s names. If you know C and you grok regular expressions, then you can learn AWK in about 5 minutes. If you only know C, go read up on regular expressions and come back. Five minutes later you will know AWK. If you are running Linux, you probably already have GAWK installed and can run it using the alias awk. If you are running Windows, you might consider installing Cygwin, although there are pure Windows versions available. If you just want to play in a browser, try webawk. Here’s an interesting tip that can help improve your ability to write assembly code. In an effort to remove the complexity of assembly code for an AVR project [Quinn Dunki] figured out how to use macros when writing AVR code with the GNU toolchain. Anyone using AVR-GCC should keep this in mind if they ever want or need to pound out a project in assembly language. If you look at the code snippet above you’ll see two commands that are obviously not assembly; PulseVRAMWrite and DisableVRAMWrite. 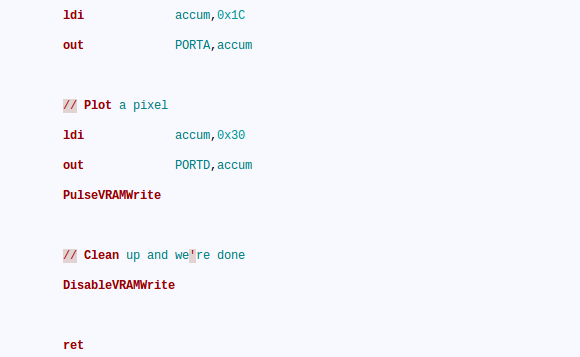 These are macros that direct the assembler to roll in a hunk of code. But avr-as, the assembler used with this toolchain, lacks the ability to handle macros. That’s too bad because we agree with [Quinn] that these macros make the code easier to read and greatly reduce the probability of error from a typo since the code in the macro will be used repeatedly. The answer is to alter the makefile to use GNU M4. We hadn’t heard of it, but sure enough it’s already installed on our Linux Mint system (“man m4” for more info). It’s a robust macro processor that swaps out all of her macros based on a separate file which defines them. The result is an assembly file that will play nicely with avr-as. Her implementation is to help in development of the GPU for her Veronica computer project. 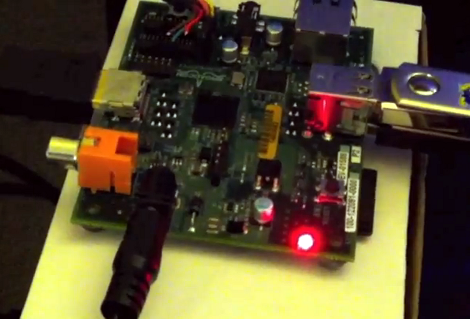 This is the Raspberry Pi board, an ARM based GNU-Linux computer. We’ve heard a little bit about it, but it recently garnered our attention when the machine was shown running XBMC at 1080p. That’s a lot of decoding to be done with the small package, and it’s taken care of at the hardware level. Regular readers will know we’re fans of the XBMC project and have been looking for a small form factor that can be stuck on the back of a television. We had hoped it would be the BeagleBaord but that never really came to fruition. But this really looks like it has potential, and with a price tag of $35 (that’s for the larger 256MB RAM option) it’s a no-brainer. Now there’s still a lot of rumors out there. We came across one thread that speculated the device will not decode video formats other than h.264 very well since it uses hardware decoding for that codec only. We’ll reserve judgement until there’s more reliable info. But you can dig through this forum thread where the XMBC dev who’s been working with the hardware is participating in the discussion. Don’t forget to peek at the demo clip after the break too. 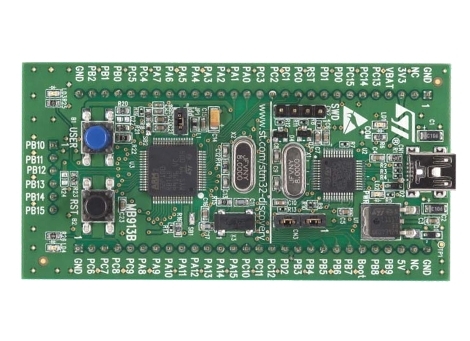 STMicroelectronics has another inexpensive development board out; the STM32 Discovery is an ARM Cortex-M3 prototyping platform. Coming in under $10 puts it right along the lines of their 8-bit offering, but this one is 32-bits with 5 KB of RAM and 128 KB of programming memory. It runs a bootloader and has on-board USB for easy programming. They’ve even got a trio of crippled IDE’s to get you started. Unfortunately this is following a growing trend with the exclusion of Linux support. [Gordon] wrote in to let us know that there is hope in a couple of forms (but not using the USB functionality). The first is a serial programmer using the RS232 that [Paul] came up with (there’s a lot more on his blog so spend some time there). But you can also use the serial debug protocol to program the board. Either way you’ll still need a method of compiling the code. We’ve had great success rolling our own GNU ARM cross compiler using this guide. Or you can grab a pre-built package by downloading Sourcery G++ lite.